Last week, I shared 5 things I am bad at. 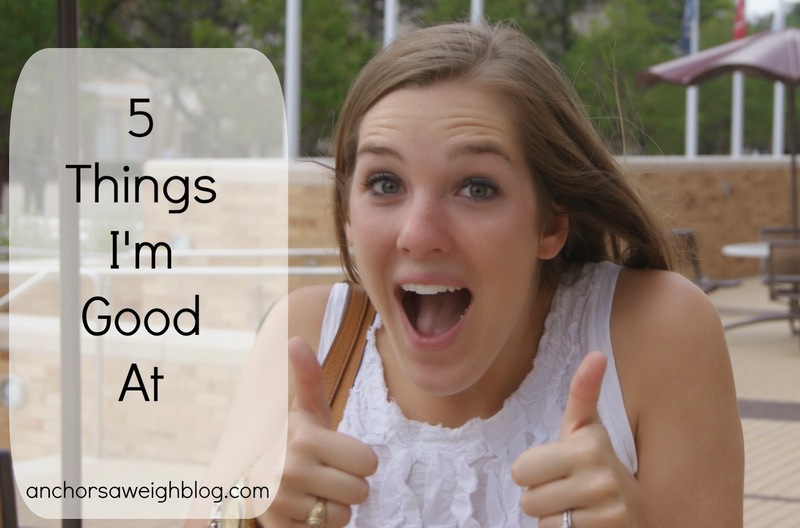 I have thought of many more things I could add to that list, but rather continue with a list that will eventually get depressing, I thought I'd go the other way and talk about 5 things I am actually good at. So, here we go. I've always been more of the English/Language Arts type. Spelling and grammar are important to me, and I cringe when I see the wrong form of "your/you're or their/there/they're used. Spelling is just something that came naturally to me. One time, in the third grade, I got a 100 on my spelling test which meant I didn't have to take the next one. I was the over achiever that actually wanted to take the test because I knew how to spell the words, so instead I spelled each word for a boy in my class who wasn't the best speller so he could do well on the test. Obviously this was cheating and we were scolded, but I thought I was just doing a nice thing at the time! I'd like to thank sorority life for this one. I'm fairly social and love to be around people. I think that especially in military life, it's important to be able to carry on a conversation with anyone. We all have to move and start over so often that we are pros at making new friends. I mess up my fair share of recipes, but for the most part, I am a pretty good cook. Thankfully Parker isn't a tough critic at all, so cooking for him is fun and stress-free. The matriarchs in my family have always done all of the cooking, and I do 99% of the cooking in our house. It's what works for us, and I wouldn't have it any other way! Jenny is my best girl friend, so caring for her is a privilege rather than a chore. Taking her on walks, feeding her, etc. have never been inconveniences to me because I love that pup so much. I'd like to think I'm a good dog owner. Good grief, procrastination should be my middle name. I will get what I need to get accomplished, but I'll wait until the last minute. This is most evident in house chores. If I know someone is coming over in 30 minutes and it will take me 10 minutes to tidy up the house, I will happily watch TV on the couch for 20 minutes and then decide to finally clean. It's kind of a problem, but then again, maybe it isn't. Well, those are 5 things I consider myself good at! Are you good at any of the same things? I am definitely a really good procrstinator. I end up waiting until the last possible second to do things and then stress out when I end up running out of time. LOL! I'm especially good at putting off doing the dishes. I'm so good at procrastination, it's sickening! Especially things I don't really feel like doing, I can put them off with the best of em! Other than that, I'm really good at writing and swimming...my two biggest passions! you are a great dog owner, and cook! i love all of your recipes! I like your positive spin on procrastination :) I too am the master of this, in fact last night I told David, "Why do today, what you can do tomorrow?" Such a Slacker!! cheese puffs and the couch are forever calling my name instead of my to do list! :) but yes you are really good at all those things! Haha I'm the same way about spelling and procrastination! Are you watching the spelling bee on ESPN? I am with you on the procrastination! Geez louise. I know I have things to do and they really won't take long....but still...I put it off. I love this idea! I may have to borrow it from you! true life: i spell check every text i send to you. true life part two: i still catch myself messing up words after the fact and wonder if you'll catch it.